I have no doubt that you can picture it now. A beautifully clean car, freshly waxed. The sun glistening off the beautiful paint. The detail and nuance of each hue dancing in the eyes of the beholder. You gaze at your beauty, ready to jump in and cruise. And then, as you round the front of the car you see it, and in that moment your car might as well be covered in mud: The gross, disgusting, dingy yellow-tinged nuisance of the foggy plastic headlight. Headlights are really important functions in any vehicle. They not all assist in the lighting during the night but also for visibility from approaching pedestrians and other vehicles. Okay, perhaps that is a bit overdramatic, but you get the point and you know what I mean. Headlamps get dingy and dirty, often much sooner than they should. So, what do you do about it? Well, if you have been desiring a life-hack for those yellow-crusted headlights, we are going to describe to you how to get rid of them! Below are several different options to make those headlights as close to new as they can be. So Why Do Headlights Get Foggy? Originally, headlights were made from glass and thus, not subject to the fogginess that plagues many cars today. Elan McAfee reports that sometime in the 1980’s, car manufacturers began switching to the plastic components that are now standard for the auto industry. This plastic, really polycarbonate plastic, is lighter, cheaper to manufacture, and is much more resistant to breakage from road debris than their glass counterparts, as noted by Larry Kosilla. These plastic lenses come coated with a protectant that is intended to keep them clean and clear. However, over time the heat from the lamp, UV rays from the sun, chemicals from cleaners and road salts, and general weather wear and tear begin to break down this protective layer, often causing it to turn yellow in color and produce a cloudy-appearance on the light. This is called oxidation, and not only does this make the headlamps, and the car itself, look dingy, it also limits the amount of light that passes through, which reduces visibility. In this article, we will cover several different ways for you to clean the headlights on your car. Some don’t deliver on the hype, others are very good DIY options to care for your lights, and others provide really good, longer-term solutions to keep your car’s lights shining brightly. Remember, this is an important area to care for on your automobile because of how it affects your car’s ability to illuminate the road. There are some basic necessities that will be used regardless of the method you choose. You will need soap or glass cleaner a bucket of water or a spray bottle, towels (terrycloth or microfiber), masking/painters tape, and automotive wax. Regardless of the method you choose, the prepping stages are the same and are essential for getting the desired result and avoiding damage to the automobile or light. The first step is to clean the headlight. Using regular soap and water or a glass cleaner, thoroughly wash the headlight removing all road buildup, bugs and other debris. Then, using a method similar to Robby DeGraff from Cars.com, tape off the edges of the lamp, using tape that will not harm the paint, to protect the rest of the car. Alex Kersten even recommends using a trash bag with tape to protect the car. Following these steps, you are ready to embark on the headlight cleaning method of your choice. 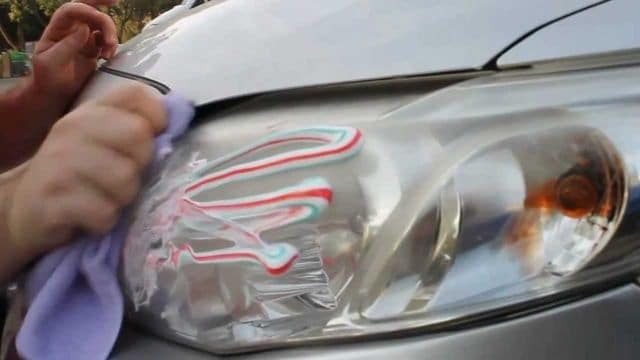 One of the most popular ways to clean your car’s headlights is with toothpaste. Yup, that’s right, the kind of good old-fashioned toothpaste you can find at your local general store. Elan McAfee points out that the granular makeup of toothpaste is just enough grit to scrape off the residue buildup that causes the fogginess on headlights. Get a toothpaste that has some grit to it. After completing the prepping steps, using a soft rag or your hand, apply the toothpaste by wiping it all over the headlamp. Then, take a tooth brush and scrub in a circular motion all over the plastic. As you scrub, you will notice the toothpaste (if it is a light color) begin to darken. This means that it is working and the film built up on your headlight is breaking away. Depending on the severity of your headlight, you can expect to spend five to fifteen minutes scrubbing and potentially may need more than one coat of toothpaste and scrubbing. Once sufficiently clean, rinse with clean, warm water and allow the surface to dry completely. The final step is to apply automotive wax to the headlight. This creates a seal over the micro-abrasions that exist in the light and keeps it cleaner longer. If you are more of a visual learner, check out this short YouTube video, featuring Chris Fix, describing and showing the process. It is important to remember, however, that the micro abrasives in toothpaste are not the proper kind for this type of detailing, and thus, the effects are not as clear as they can be and they do not last as long. A popular home remedy treatment for restoring automobile headlights is repellent with the chemical agent Deet. A quick web search will give numerous how-to’s for this one. The problem is that it is not only a superficial quick-fix, but it is actually harmful to your car’s lights. The harsh chemicals present in bug repellents are not good for headlights. They will eat into the plastic and cause damage that will inevitably lead to your headlights looking worse, not better. Granted, when sprayed on a foggy headlight, the effects seem to be instant, but as Larry Kosilla points out, they don’t last. This process, shown in the tutorial here, features different household products that garner the same effect. After prepping the automobile, pour the distilled white vinegar into the baking soda, which creates a reaction between the base and acid. After swirling for a bit, dip a soft rag into the paste and begin http://www.mindanews.com/buy-lipitor/ using it to rub the light clean. 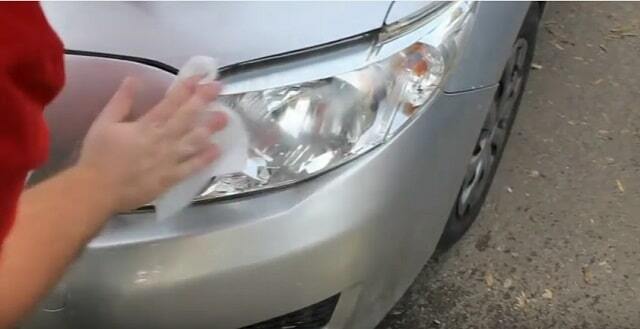 After the application is complete and light is sufficiently clean, take a clean rag and wipe the headlight clean. 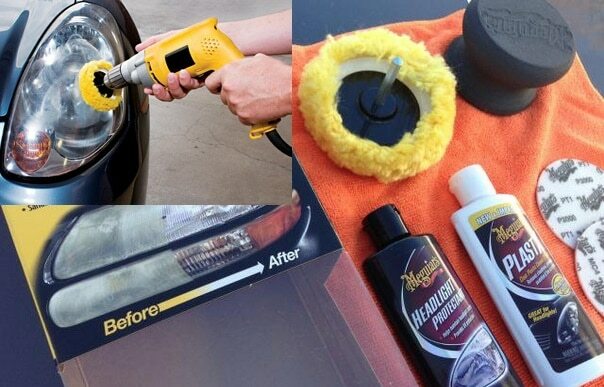 Use an automotive wax to seal the lamp from re-oxidation. Using the same basic steps as noted above to prep the car, use a soft rag and a circular motion to apply automotive polish. Continue rubbing firmly for at least five minutes per headlamp to remove the residue. As clarity improves, use warm water to rinse the light and dry. Apply wax to extend the life of the treatment. If you are looking to get a little closer to a professional grade job, you can buy Headlight Restoration Kits. Kits range in price and can be found at your local automotive dealer. Generally, the kits include a polishing substance and a gritty microfiber buffer pad that attaches to a cordless drill. It is important to follow the instructions carefully for your specific restoration kit. Robby DeGraff has written a great article on this with gif illustration. Additionally, HomeRightTV has a great video tutorial on how to properly use a kit to restore your headlights. After cleaning the headlight and prepping the area, apply the polish thoroughly in a circular motion. 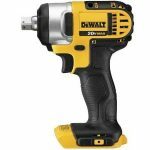 Attach the included buffer pad to your cordless drill or buffer, put some polish compound to the buffer pad, set to the appropriate setting as noted by the directions, and begin the buffing process. Once the buffing process has sufficiently cleaned the headlight, clean and dry the light. What if there’s more than just oxidation causing my headlight problems? Boy, we are glad you asked! Often, headlights suffer from more than just garden variety oxidation. The wear and tear of hard road chemicals and loose gravel and debris can cause deeper scratches or pit in the lights, which is much harder to deal with. Using this method can get rid of both issues. The consensus among car restoration enthusiasts is that wet sanding headlights is the best way to get great results. It should be noted that this process is much more detailed. The novice should proceed with caution, following steps carefully, in order to avoid damaging headlights. You must find the right kinds of sandpaper for this application. You will need a few different grit ratings to get going. Start with what is typically classified as a super find grit, around 800 to 1000. In addition to this, get some 1500, 2000, and 2500 or 3000 grit sandpaper. The amazingly fine grits are needed to keep from creating such large scratches in the plastic headlight. This process will be slower, and you will start with the 800 to 1000 grit sandpaper and work your way up to the 2500 to 3000 grit. Start by gathering the same basic products that have been mentioned in this article thus far. Clean the headlight and tape off the car, perhaps even using the bag idea. The process goes like this from here: Starting with the lowest grit sandpaper, fully sand the entire light, using warm water with a bit of soap in it, or an automotive polish. This acts as a lubricant for the sandpaper. In the non-sanding hand, keep a spray bottle of the water and periodically spray the dirty film off as you sand. After completing the sanding with the 800-1000 grit paper, clean and wipe down the headlight. It is very important to do this next step to completion before continuing. After each stage of sanding, you much clean and then polish the light before moving on to the next sandpaper stage. This seems redundant and unnecessary; however, it will ensure that the headlamp is clean and clear and that you can see where your trouble spots are. Sometimes you will think that you have buffed out all the spots that need buffing in that stage, but often you will miss spots without polishing in between. For the best results, especially if your headlight haze is caused by more than just oxidation, alternate between sanding and buffing. Continue the steps above for each stage of sandpaper grit. Also, when sanding, be sure to alternate your sanding patter at each stage. This will keep the abrasions caused by the sandpaper from becoming too redundant and carving deeper grooves than necessary into your lights. For example, go up and down on the 800-grit stage, then left to right on the 1500 grit stage, and then diagonally on the 2500-stage. Larry Kosilla over at AMMO NYC has the best tutorial available on this topic. His knowledge and skill are great to learn from. And if you do not have the time to watch the video, check out the AMMO NYC Podcast instead. You should keep in mind that these fixes, especially when using buffers or wet sanding, should only be used when necessary. Specifically, with sanding, you are removing layers of plastic on your headlights. When done too much, this can lead to cracking of the headlamp unit. After trying these approaches, if you still do not have the results you are looking for, your best bet is to contact a mobile detailing professional. There are some headlights that are simply beyond repair, which is unfortunate because they are very expensive to replace in most cases. One last thing that you need to know is a simple safety precaution. 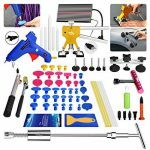 Professionals in the field of auto body work and many of the DIY sites reference here will tell you that you must protect yourself against many of the products featured here. Always wear plastic or vinyl gloves that are resistant to the chemicals used in these cleaning measures. Also, protective eyewear is crucial to keeping your eyes safe. We hope that these pointers are helpful to you and the cars you care for. Visit any of the hyperlinks embedded in the article to read more details about this important part of caring for your car.